MARTIN, Tenn. – The University of Tennessee at Martin now has a drug take-back box installed at the Department of Public Safety in Crisp Hall. This sealed container is provided by the Weakley County Prevention Coalition and allows students, employees and community members to safely dispose of prescription drugs and other unwanted or expired pharmaceuticals. The coalition has also trained UT Martin campus police officers in the use of nasal Naloxone, a drug used in the event of an opioid overdose, whether intentional or unintentional. Gov. Bill Haslam recently stated that three Tennesseans die each day from various kinds of opioid overdose, and local law enforcement is partnering with the Weakley County Prevention Coalition to keep area citizens and students from experiencing fatal overdoses. These steps come on the heels of University of Tennessee System President Joe DiPietro’s third annual State of the University address Feb. 28, which focused largely on the state’s opioid epidemic. DiPietro promised to put the “might of the UT System” behind combating the crisis statewide. According to the Weakley County Prevention Coalition, enough painkiller prescriptions were written in Weakley County alone for each county resident to have 1.3 prescriptions in their name in 2016. Statistics from 2017 have not yet been made available. The drug take-back boxes accept all prescription and over-the-counter medications; veterinary medications; medicated ointments, lotions or drops; liquid medications in leak-proof containers; inhalers; and pills in any packages, including glass, plastic, Ziploc baggies or foil packs. Items not accepted include illegal drugs or narcotics; needles or syringes with needles; blood sugar equipment; thermometers; IV bags; bloody or infectious waste; or personal-care products such as shampoo and non-medicated lotions. 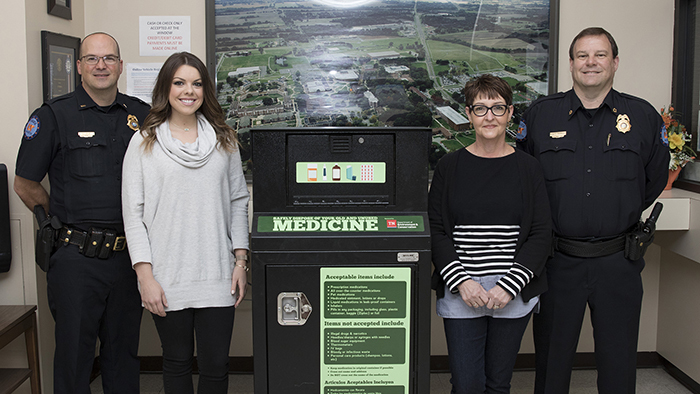 The UT Martin drug take-back box is the fifth permanent location in Weakley County. The others are located at the Martin Police Department, the Greenfield Police Department, Sharon City Hall and the Weakley County Sheriff’s Office in Dresden. Other local boxes can be found at the Henry County Sheriff’s Department in Paris, and at the police departments in Union City, Troy, South Fulton and Paris. To find a drug take-back box near you, visit tdeconline.tn.gov/rxtakeback. Those who are not comfortable bringing their unwanted or expired medications to a take-back box are encouraged to drop off their items during a Drug Take Back Day, which are held twice each year. The UT Martin campus will host a Drug Take Back Day on April 27 at the campus Department of Public Safety. The Weakley County Prevention Coalition also distributes lock boxes for parents to use when keeping medications away from children and teenagers. For more information, contact the coalition at A href="mailto:weakleyprevention@gmail.com">weakleyprevention@gmail.com. PHOTO ID: Pictured with the county’s newest drug take-back box, located inside the UT Martin Department of Public Safety in Crisp Hall, are (l-r) Lt. Charles Jahr; Suzanne Harper, director of the Weakley County Prevention Coalition; Dr. Deborah Gibson, UT Martin professor of health and human performance and a member of the Weakley County Prevention Coalition; and Scott Robbins, director of the Department of Public Safety.